Episode 86 - It seems like Yuddistira always had a secret desire to give up the world and live like a sadhu. But now he has a pretty good justification-- after all, he even killed his elder brother. Crimes like this demand extreme penance, and Yuddistira would like nothing better than to embrace that lifestyle. No one else agrees with the new king however, and his brothers, Krishna, and the Rishis all take turns trying to convince him that the best use of his life would be to take up the crown and rule, according to his dharma. They never quite seem to convince him, but Krishna and Narada at least manage to distract him with a story of a boy who crapped gold nuggets (Suvarnashthivin). 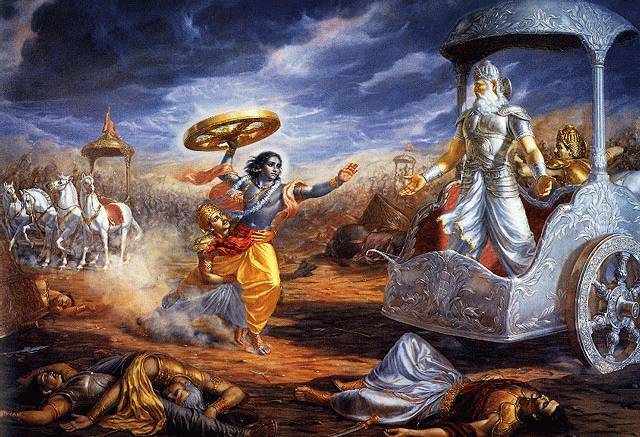 Also, Yuddistira has learned to always obey Krishna, and Krishna is adamant that he take up the throne and rule. Holiday Message - Is Kubera Santa Claus?